I mean, you could always have your character be cursed/affected by/afflicted by a magical spell that specifically destroys their appearance as a halfbreed because they didn't talk right to a fairy, got crippled by a failed experiment, or participated directly in the war that's part of this Sb's lore, and then you could have something close to an Orc! I... suppose it's still not the same, but eh, just throwin' out suggestions your way, is all. Ooo. An nymph curse for having bathed in her stream...i like it! But...having fully accepted it and embracing the physical changes to himself. Ahh I meant to submit my CP at least a week or two ago, but finishing up the very last bit slipped my mind! I'll do my best to get it in ASAP. @XxXTheSwordsmanXxX Now we're talkin'! 'Cause yeah, that totally explains the Ruffian status, the character having embraced his/her fate makes for a fun character trait to work on, and that allows you to have what can easily be considered as an orc without breaking the lore or, y'know, causing issues for anyone, depending on how you write this. And good luck with these last additions to your CP, @Lael! Got mine to worry about to, so I get the feeling. I did the thing! My CP is ready. @TinkerTwaggy ahaha you make SBs so much fun! @XxXTheSwordsmanXxX as Twaggy said, you could have a character that has been affected by magic. I really wanna see how you do this ahaha. Dorian, are you the one adding all the spices to our food? Because frankly the food here tastes like poorly cooked sawdust. It genuinely tastes how Solas looks. Also, sorry for the double post, I'll be making my own character to fill hopefully the last slot, otherwise if I get all six slots filled out I'll be writing from the Pincess's PoV. 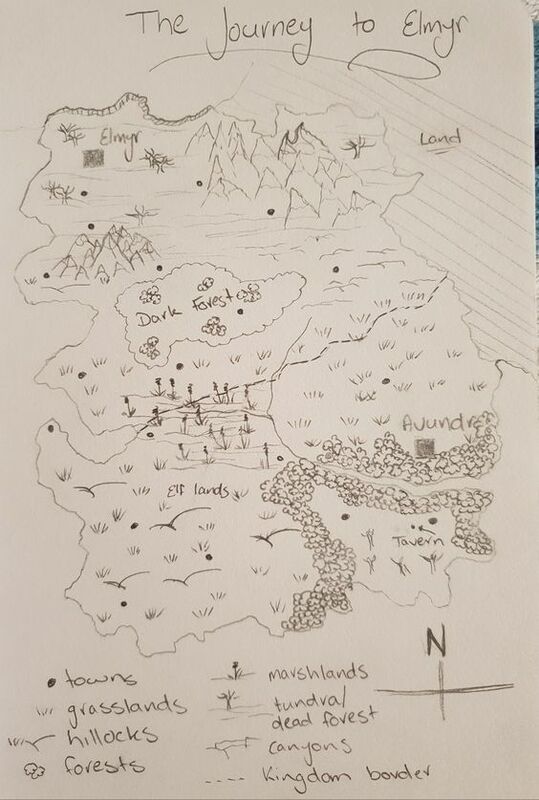 Also I drew a map for the SB, and I can post a picture of it if everyone wants. @Basil I’d love to see your map! Okayyy here's the map for Elmyr and Avundr. I've marked the spot where the tavern is, which I kinda want to be the starting point for the SB. Last edited by Basil on Tue Feb 12, 2019 4:10 am, edited 1 time in total. Oh also, nooot sure what's going on with the map, but clicking on it leads me to Temporary Error (500) page, which prevents me from accessing it. D'you think you can upload your image in another way? Also, done with my character! Went for a Half-breed (Half-Nymph, Half-Fae), 'cause yeeeah, I just gravitated towards that idea XD Hope you like it! Okie dokie map should be fixed! It's been fixed indeed! It seems a lot less big than I assumed it would be, but I like how many towns seem present. Well, that and, due to the fact that it's a map, the actual journey's gonna take much longer than it looks, and we're going to meet some trouble along the way. Fun stuff! Ooh I just thought of something that might make good character development / plotsies! I had an epiphany earlier today--the princess is (unintentionally) the same age as Kilian's sister, so maybe once they get to know each other a lot better, he might start thinking of her like he would Ena.